We moved to the Centralia Outlet Mall. Please come out and join us! Please show your support to our sponsors!! Without the help and assistance they provide, we wouldn't be here! Would you, your Group, or your Business like to be a sponsor of the Centralia Farmer's Market? Please contact the Market Manager, and discuss the opportunities!! We have a much larger customer base now, with lots of visibility, and lots of exposure! WA. State Farmers Market Assoc. 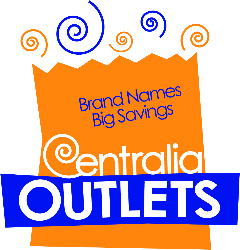 The Centralia Factory Outlet Mall.